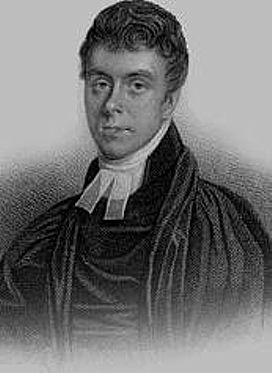 Henry Martyn, who studied in Cambridge University, is remembered for his work as a translator of the Scriptures, and as a missionary to the people of India and Persia. He lived only 31 years, but in that short time his inspiring life and scholarship laid down the foundations for future mission work and missionary vocations. Martyn was born 18 February in 1781 in Truro, Cornwall. As a boy, he was educated at Truro grammar school and at 16 he came to Cambridge to read mathematics. He had a brilliant mind and also had a gift for languages. He graduated with a First Class degree in mathematics and was given the title of Senior Wrangler, awarded to the top maths undergraduate at the University. This position is said to be the greatest intellectual achievement attainable in Britain. He was elected a Fellow of St John’s College. But, inspired by the preaching of Charles Simeon, he was ordained, and became an assistant to Simeon at Holy Trinity Church, Cambridge. He also had charge of the nearby parish of Lolworth. Martyn felt called to mission work and wanted to offer his services to the Church Missionary Society (CMS), but a financial disaster deprived him and his unmarried sister of the income their father had left them. The newly founded CMS had insufficient funds to support him as well as his sister, and so he accepted a chaplaincy to the British community in Bengal from the British East India Company who were to employ him. He left for India in 1805, but it was never his intention to minister only to the British. On his voyage, he witnessed the British conquest of the Cape Colony. He spent the day tending to the dying soldiers and was distressed by seeing the horrors of war. This experience led him to believe that it was Britain’s destiny to convert and not colonise the world. Martyn arrived in India in April 1806. He set about learning to speak the local languages and to visit Hindu temples to explain the Christian gospel. His priestly work was not always appreciated by the East India Company. For instance, it was forbidden to recite the Magnificat at Evensong in case the idea of ‘putting down the mighty from their seats’ was taken too literally. He refused to regard Indians as inferior and his respect for the Indian culture annoyed and alienated many of his peers. Encouraged by fellow evangelicals, he made Bible translation his main task. Undeterred, he began to translate the New Testament, and the Book of Common Prayer, into Urdu, and to supervise the translation of the New Testament into Arabic and the Persian language, Farsi. Late in 1810, suffering from tuberculosis, he took a leave of absence and prepared to set sail to a drier climate on what was to be his final voyage. His aim was to travel through Persia (modern day Iran). On his arrival, he met Moslem scholars and other Christian missionaries and debated the merits of Christianity and Islam with them. These conversations enabled him to thoroughly revise his Persian translation of the New Testament. Unable to make the journey to Tehran himself, the British ambassador to Persia, presented a copy to the Shah. Martyn hoped eventually to return to England to persuade a childhood sweetheart, who had refused an earlier request, to marry him. He began his journey by land travelling towards Constantinople and continued his mission work, far from home and from any English community. Tragically Martyn died in Armenia in 1812. He was buried by the Armenian Church with honours ordinarily reserved for one of their own bishops. He is commemorated in the calendar of the Church of England on the date of his death, 19 October. Through all this time he kept a series of journals and a full correspondence, which provide a remarkable record of his life and work. His diary has been described as one of the most precious treasures of Anglican devotion. His work inspired many more missionaries who were called to overseas work throughout the 19th Century. On the centenary of his birth, in 1881, a fund was created to endow what became the Henry Martyn Hall. It was built next to Holy Trinity Church as a meeting place for the University Church Missionary Union, and to house a library and museum. The Library recalls the scholarly basis of much of Martyn’s work as a missionary, as a debater with those of other faiths and as a translator of the Bible and the Prayer Book. Today, the Library and the Henry Martyn Centre are housed at Westminster College, Cambridge.